Shane White is the Challis Professor of History and an Australian Professorial Fellow in the History Department at the University of Sydney specializing in African-American history. 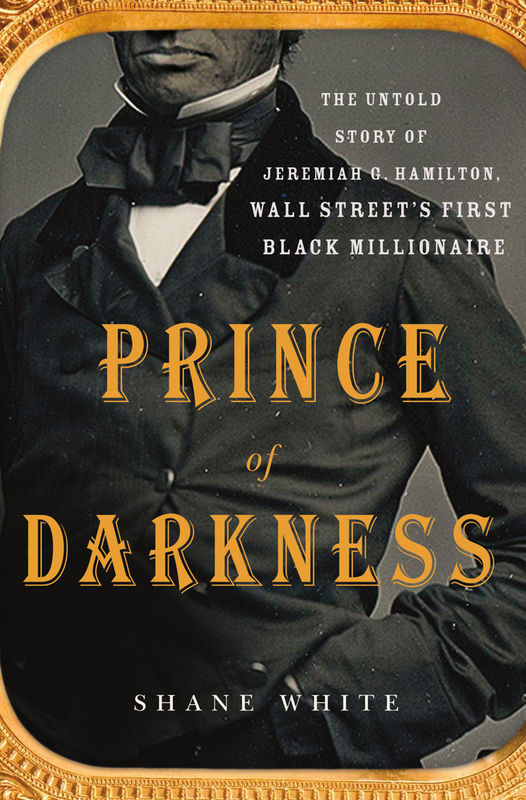 His book, Prince of Darkness: The Untold Story of Jeremiah G. Hamilton, Wall Street’s First Black Millionaire, was this year’s SHEAR Book Prize winner. The Republic (TR): For those who haven’t read your book, would you provide a synopsis? Shane White (SW): In Prince of Darkness, I recount the story of Jeremiah G. Hamilton’s life. Hamilton, born in 1808, first turns up in New York in 1828 running counterfeit coin to Haiti for a consortium of merchants. He moves permanently to the city in the early 1830s, struggles for a while, and then begins to establish himself as a guy who can make money for you on Wall Street. He always sailed rather close to the wind. Initially he had a reputation, deserved, for over-insuring boats and then arranging to have them scuttled. He invested his first fortune in real estate, in 1836 buying houses, a 400 foot-long wharf, and land in Poughkeepsie. The 1837 “panic” ruined him and he went bankrupt. But Hamilton bounced back and made another fortune on Wall Street, dispensing advice on what stocks to buy to white investors. Although Hamilton was hardly pure as the driven snow (but then who was on antebellum Wall Street), he also faced considerable discrimination. The second stock exchange in NY passed a resolution in the mid-1840s that anyone who dealt with Hamilton would be expelled. In 1863, during the Draft Riots, a mob invaded his house—the intention of its members had been to hang him from the lamppost out the front of his house on East 29th Street, but he, sensibly had hightailed it over the back fence. When he died in 1875, he was reportedly worth some two million dollars. TR: What led you to choose this topic for your book? SW: I have been reading New York nineteenth-century newspapers and court cases for decades and I kept on coming across references to him. It took a while for me to realize that the person I had found running counterfeit coin in 1828 was the same person suing Cornelius Vanderbilt in the 1850s. But once I did, I started to pursue him actively not quite knowing what I was going to do with the material. In the end the challenge of writing a book about someone about whom absolutely nothing was known drew me in and took a couple of years out of my life. TR: By the time you were finished writing, were you satisfied that you knew the real Jeremiah G. Hamilton? SW: Absolutely not!! Prince of Darkness is an unusual book. By dint of a lot of hard work, I found surprising amounts of material on some parts of his life. But I haven’t a clue what he was doing for years at a time. And he did not leave a diary or letters somewhere convenient for biographers. I almost never have any indication of what JGH was thinking. This means that there is a lot of “context” in the book. By my lights, and by using JGH’s life, I think the book ends up developing a new version of what it meant to be African American and walking the streets of NYC in the 1830s and 1840s. Some readers like this—others, several “Amazon” commentators come to mind (does anyone but the author of the book in question ever read Amazon readers’ comments?) have been bored to tears by it. On this count I was particularly gratified that the SHEAR prize committee awarded it the best book prize and not the biography award. TR: Which historians and/or writers most influenced your research for this book? SW: In my view, there are two major influences on the way I write history. The first is the “Melbourne School” of ethnographic historians, notably Rhys Isaac, Greg Dening, Inga Clendinnen and Donna Merwick. The other important influence is the work of my friend Larry Levine. From these scholars I learned how to approach and exploit sources in such a way that I could write stories about African Americans who had been left out of other historians’ accounts. More specifically, in terms of writing about JGH, I always had in mind such classic books as Natalie Davis, The Return of Martin Guerre (1983), Linda Colley’s The Ordeal of Elizabeth Marsh (2007), and particularly the wonderful Al Young’s brilliant The Shoemaker and the Tea Party (1999). As well, some of the recent archive-rich work on slavery was helpful: most obviously, James Sweet, Domingo Alvares (2011) and Rebecca Scott and Jean Hébrard Freedom Papers (2012). TR: What is your current/next project? SW: At the moment I am half way through writing a book about black confidence men and women. This is another subject where the African American “contribution” has been erased from American history. For most people, confidence men, the “aristocrats” of the criminal world, were white and male. Paul Newman and Robert Redford in The Sting are, for many people, the only con men. My argument is that there were two golden ages of the black con in New York history, one in the 1830s and first half of the 1840s and the other in the 1920s and 1930s. Not coincidentally, both periods were particularly important and exciting in African American history. My conceit is that I can use the patter of con artists, how they fooled their marks, to write African American economic history not from the top down but from the bottom up. My intention, then, is to utilize black confidence men and women as a point of entry into Black Manhattan’s underground economy.